In the race for TRUSU president there was a face off between current president and PSA affiliate Tatiana Gilbert, who sought reelection, and Yours Truly affiliate Gagandeep Singh. Gilbert was successfully re-elected and secured 53.7 per cent of the vote, with a total of 861 votes. Gilbert first ran for office back in the spring of 2017, with ambitious ideas and a lot of student issues at TRU that she wanted to address. However, Gilbert says the role was hard to step into and navigate at first. “I don’t think anyone is ever fully prepared for stepping into the role of president,” she said. Before running in the election, she read the job description and had a basic understanding of what would be expected of her. She says that the job tends to require a lot more than just what’s on the job description and there are just some elements that you can’t prepare for and you just have to learn as you go. Learning these skills, meeting new people, advocating for students and figuring out the logistics of job can take some time, Gilbert said. Even though being president is big role with a lot of responsibilities and requires a lot of time and hard work, Gilbert says that she sought reelection because it’s something she loves doing. 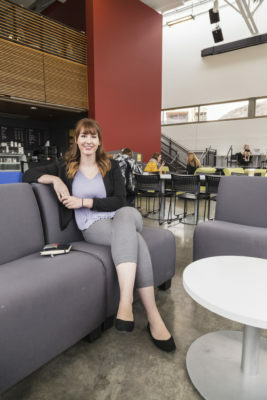 Her position in TRUSU has helped her to find new passions and learn new skills, as well as becoming more involved in the campus and aware of other students’ experiences. During her first year in office, Gilbert says that TRUSU has had a lot of successes with events, student outreach and campaigns. Although if she had to narrow it down to just one thing, she would say the Hungry for Choice campaign was probably the most successful. Before her initial election into office, Gilbert, in a 2017 interview with The Omega, cited that money was one of the big issues she planned on addressing. Addressing the issue of money came to fruition through a variety of TRUSU campaigns that have advocated for open textbooks and ultimately TRU’s lack of government funding. Looking forward to her next term, Gilbert says some of her goals will be to have a larger impact within the community and to see more involvement and participation from the TRUSU board of directors. As for what TRUSU’s priorities will be for the upcoming year, those decisions will be made once the new board has stepped in and done their strategic planning over the summer months. However, Gilbert says that there are three things that she knows will for sure be continuing on for next year, the first is the Hungry for Choice campaign. The second campaign that will continue into next year is Fund the Future. The last TRUSU priority that Gilbert confirms will continue to be a priority in the fall is World University Service of Canada (WUSC) referendum.